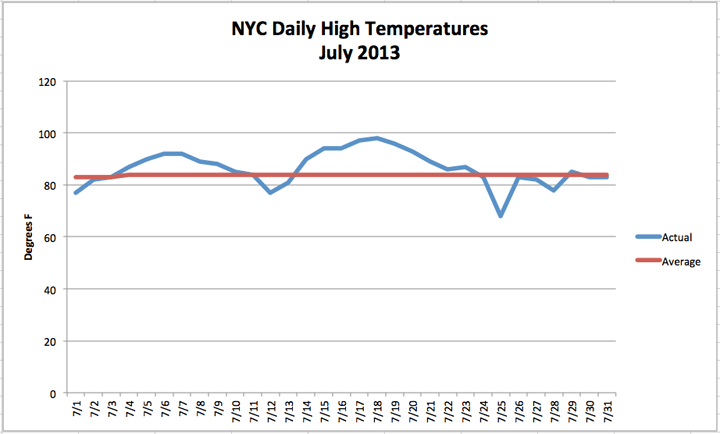 July is usually the hottest month on the calendar for New York City, and this year temperatures soared. We had two separate heat waves and a total of ten days reaching 90°F or higher. The second heat wave of the month was a lengthy event. Lasting seven days, it was the city’s longest heat wave in eleven years. This extreme heat brought the city’s average monthly temperature up to 79.8°F. That is 3.8°F above normal. While searing temperatures dominated the month, the city also experienced a few cooler than average days this July. In fact, July 25th set a new daily record for the coldest high temperature in Central Park with a peak reading of only 68°F. In terms of precipitation, NYC was mostly dry. We received 2.84 inches of rain, which is 1.76 inches below normal. This was a significant departure from last month’s near record rainfall. This entry was posted in weather and tagged heat, nyc, record, stats, summer by Melissa Fleming. Bookmark the permalink.